Now that I’ve officially taken up residence in Chicago I hope to write about my experiences from time to time. I’ll label them all “The Chicago Files” for easy reference. 3 months ago I graduated from the Wake Forest University School of Divinity with a lot of mixed feelings. I was excited that I had earned the Master of Divinity Degree but it was also no secret that I was terrified of what that meant for my life. With all the changes going on around me I was going to need to also pickup life in North Carolina, where I’d lived all my life, and move. I was excited about how many new opportunities Chicago would offer me: new friends, the chance to explore the ELCA National office, a year imbued with Lutheran studies to supplement my degree and so much more, yet I couldn’t help but feel like part of my life was ending, a part that I cherish, so that a new part could start. Well I made the move yesterday morning. It was tough, for sure. But, I was also able to meet people that I had been communicating with for months online and will continue to do so as more and more people move in for the school year in the coming weeks. Today I got out of the apartment to explore Hyde Park, the Chicago neighborhood where I live. At a friend’s recommendation I came across a park about 2 blocks or so from my apartment with the recommendation of good places to set up my hammock when it arrives later this week. I decided to check it out. I went and found the perfect spot for my hammock just as I was told I would, but what else I found made my heart sing. 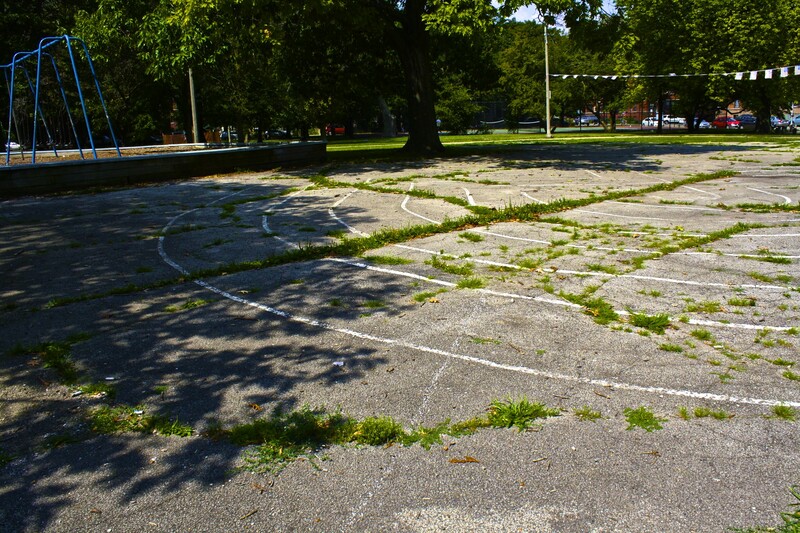 There next to the swing set partially obscured by grass growing through the pavement was a Labyrinth. Anyone who’s seen me at Wake Div throughout the years knows that whenever there is an opportunity to walk the Labyrinth I take it. I find the meditations offered there, learned from Wake Div’s Chris Copeland, powerfully meaningful and what better time to have an intentional Labyrinth walk than my first full day in a new city? As I walked the Labyrinth realized that my life in NC wasn’t ending, that instead it was connecting here at this place, at this time. I wasn’t starting a new journey so much as continuing an old one in a new place and that brought me peace about this move for the first time in over a year. Will I still have hard times while out here? Most definitely. I don’t think I ever would’ve been ready to move. I was happy where I was but without this opportunity I may never have had the chance to get to know a new city filled with new stories and experiences. It’s time to be an active participant in this experience. I feel the love and strength of Wake Div behind me and the sheer possibility of the experiences that lay ahead. Maybe, just maybe, I can do this.